Maine Once Again Allows Mail-Order Canadian Drugs To Cut Costs : Shots - Health News Mail-order foreign pharmacies became less popular after a 2006 law helped seniors get Medicare coverage for medications. But many seniors still have trouble paying for drugs. The Maine legislature just approved a new law so its citizens can once again order drugs from Canada and Europe. They're back: Cheaper mail-order medications from Canada and other foreign lands. It's deja vu all over again in Maine. 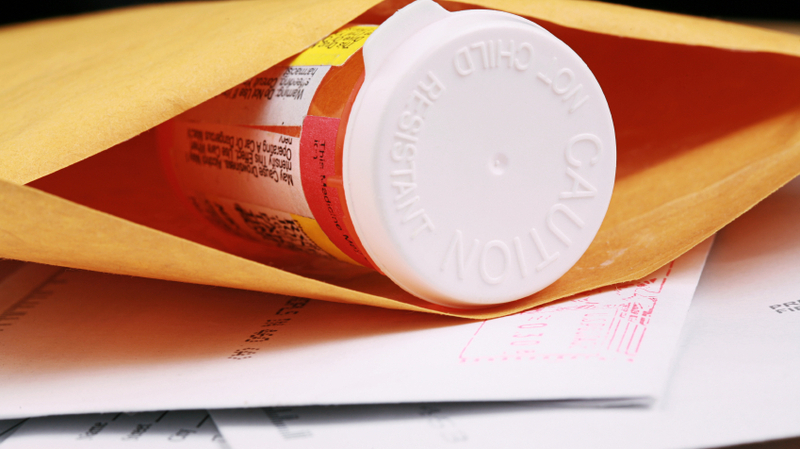 For the first time in years, a state has acted to allow its citizens to purchase prescription drugs by mail from other countries. The idea is to take advantage of those nations' lower prices, which can be half the cost of those at American pharmacies. The Maine law was enacted automatically at 12:01 Thursday morning after GOP Gov. Paul LePage failed to sign or veto it. It was passed by the Maine House and Senate on June 13 and 14, respectively. The bill became necessary because Maine's attorney general ruled last year that CanaRX, a Canadian mail-order company that had been serving public and private workers and employers around the state since 2004, couldn't operate in Maine because it couldn't be licensed as a pharmacy. The issue was a more potent one before the 2006 implementation of the Medicare prescription drug law. Back then, many seniors lacked prescription drug coverage and could not afford their medications. So they were drawn to cheaper alternatives, including ordering from mail-order pharmacies in other countries. Passage of the 2006 law for the first time gave most seniors prescription drug coverage. But it didn't take away the problem of being unable to afford medication, says Gabriel Levitt of the online pharmacy finder Pharmacychecker.com. "Research from the Commonwealth Fund has shown that 50 million Americans are not getting needed medication due to the high price of medications at U.S. pharmacies," Levitt says. "The State of Maine has resoundingly declared that this state of affairs is unacceptable." These drug-import programs have a long history of controversy. The Food and Drug Administration (under Democratic and Republican presidents alike) have warned that opening the country's drug distribution system could expose consumers to counterfeit or adulterated products. "Medicine bought from foreign sources, such as from Internet sellers, from businesses that offer to buy foreign medicine for you, or during trips outside the United States, may not be safe or effective," an FDA spokesman told Shots via email. "These medicines are illegal and may present health risks, and FDA cannot ensure the safety, efficacy and quality of medicine from these sources. FDA cannot help consumers who have problems with medicine obtained from outside U.S. regulation and oversight." The pharmaceutical industry also isn't keen on consumers importing drugs. "Opening our borders to unapproved imported drugs could increase the flow of counterfeit drugs into the U.S.," says Matt Bennett, senior vice president of communications for PhRMA, the pharmaceutical industry's lobbying arm, "putting patients at senseless risk and with little recourse against their injuries." But Health and Human Services Secretary Kathleen Sebelius may have a bit of a conflict on this issue. Back in 2004, as governor of Kansas, she participated in one of the efforts to allow residents of her state purchase drugs from Canada and Europe.